← Ria D’Etel … Spring Tides ! 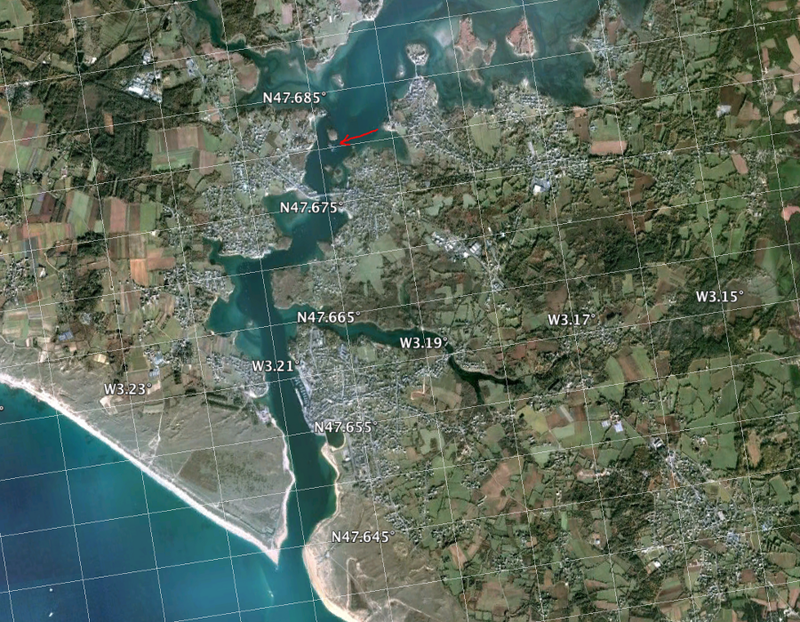 Here’s a google earth view of the area showing the two Islets creating the white water on the Flood tide. Below these two Islets is another rocky clump which creates a powerful wave on the Ebb. The current flows around 7 knots here and on the big springs you will see large boils rise in the water then dropping into whirlpools, really chaotic water. In the video clip are three different playspots. The video was shot around 15.30 hrs, Low tide on the Etel was at 12.10 hrs. At the time of he video, the volume of water and the tide height had increased to the point where the water starts to flatten out, better shaped waves are a little earlier, although the speed and power of the water increase. The tidal coefficient was a high spring at 104, and on this occasion the water was higher than expected because of the low pressure. These two aerial shots show the Islets from two sources, that on the left is google earth and shows the plumes of water on a rising tide. The quality of the imagery published by Pages Jaunes is far superior to that on Google earth or maps, I use it all the time when trip planning.